Last night when I made the Strawberry Rhubarb Jam, I decided I couldn’t wait to enjoy it. So I took some of the jam and made these simple and sweet little hand pies. The pie dough takes just a few minutes to prepare. I did mine in the food processor. Wrap in plastic wrap and chill for at least 30 minutes before rolling. Be sure to cut vent holes!! Like any traditional fruit pie, these require venting. Otherwise they will probably burst from the steam created by the filling. 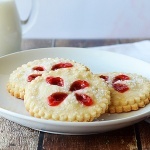 As I mentioned above, the filling was created using our Strawberry Rhubarb Jam. Place the cutout without vent holes on the cookie sheet. Spoon filling in the center, being sure not to go all the way to the edges. Using your fingers, wet the edges with a bit of water and place the cutout with the vent holes on top. Press the edges lightly to seal. We just spritzed the tops with water and sprinkled with sugar prior to baking. Bake until golden. Some of the jam will likely seep out of the vent holes. This is normal. 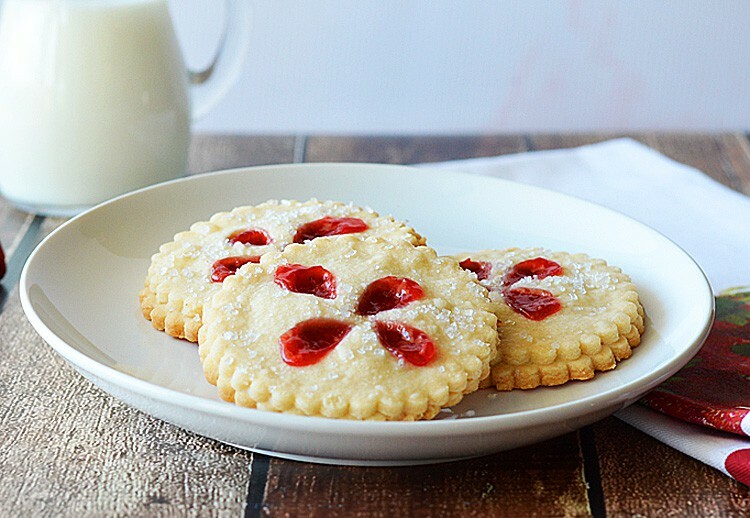 If you use less filling, you will have more cookie than jam. Kind of too much cookie. I don’t know about you, but I am ok with (and totally prefer) a little seepage of jam 🙂 Don’t try to overfill or you’ll have a great big mess on your hands. Literally. Cool before serving as the filling is VERY hot. Combine all ingredients in a food processor except the ice water and process until coarse crumbs appear. Drizzle in the ice water until a ball of dough is nearly formed. Turn out onto a lightly floured surface and knead until it just comes together, 4-5 turns. Once chilled, turn out onto a lightly floured surface and roll to 1/8" thick. Using a 3" cookie cutter, cut out enough for 8 tops and bottoms. 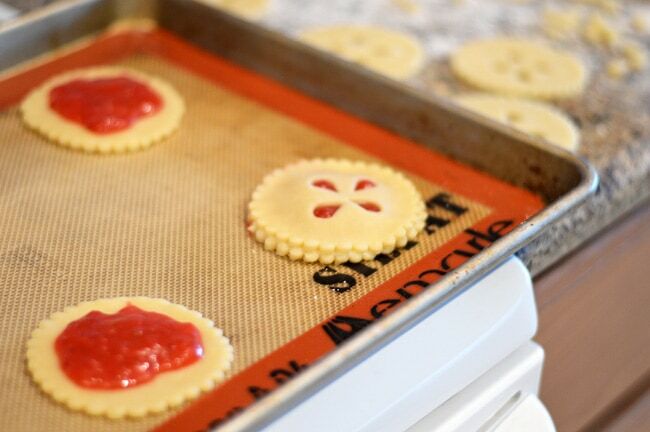 Place the bottoms on a prepared cookie sheet. For the tops, using mini cutters or just a sharp knife, create vents. Spoon about 1 Tbl of the Strawberry Rhubarb Jam into the center of each of the bottoms taking care not to get too close to the edges. Do not overfill. 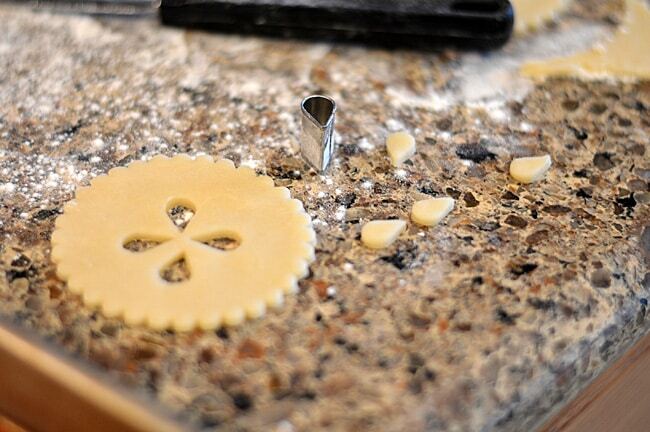 Using a bit of water on your fingertips, moisten the edges of the bottom crust. 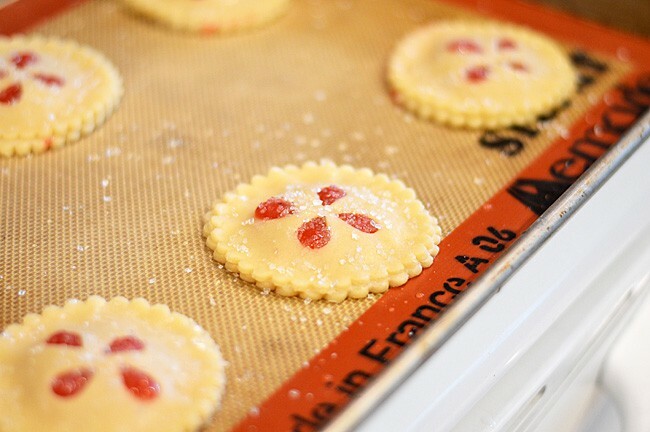 Place the vented tops over the filling and press to lightly seal the edges. This will prevent the filling from oozing out. 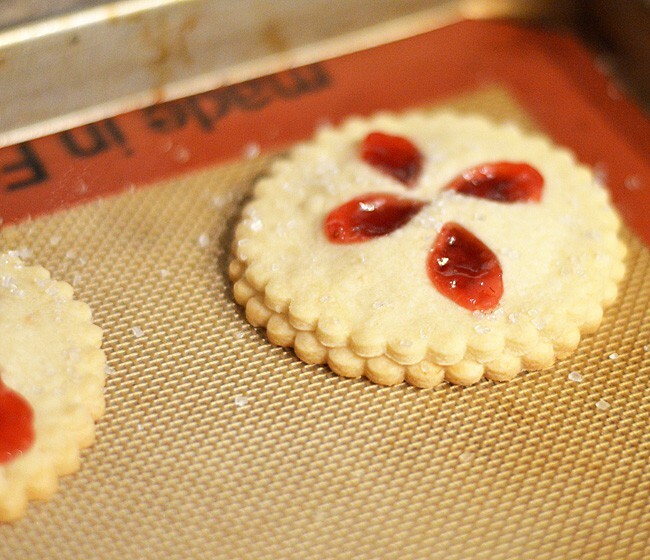 Spritz the tops of each cookie with water and sprinkle with a bit of sugar. Bake at 350 degress for about 20 minutes or until golden. This looks so delicious. 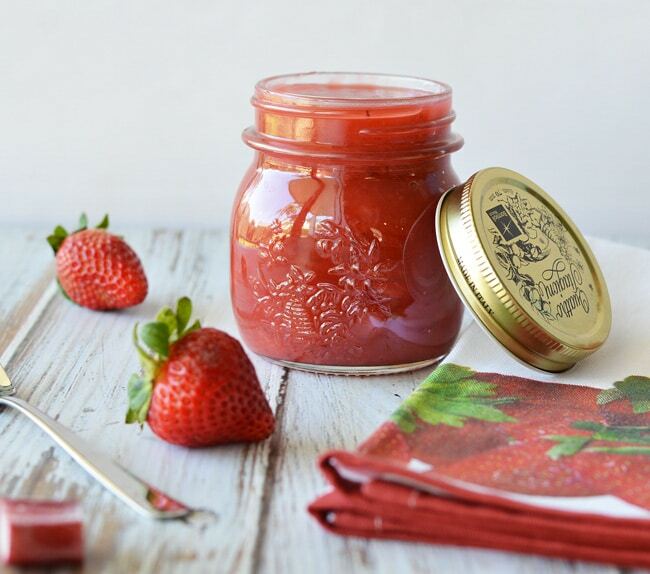 I bet the mixing of Strawberries and Rhubarb is going to give this recipe a wonderful taste flavor. I’m going to make this for BUNKO. My husband will love them. But first I have a quick question about the sugar. Is that 1 1/2 cups of sugar?